What an exciting time this is for you and your fiancé! The proposal, the ring, all the wedding planning and then the Engagement Session! Engagement photos are not very important to some couples and others don’t understand what the point is. Well let me tell you some reasons why they are VERY important and why every couple should get these done with their wedding photographer. 1). This session is about you. What you both love, your hobbies, where he proposed, your first date…I can go on and on. On your wedding day the pictures will be about you of course but they will be about the Wedding. Engagement photos represent where you are in your relationship and what is important and significant to you as a couple. 2). This I should have listed as number one because I feel this is the most important. Unless you are extremely outgoing, confident, a model or actor…Standing in front of the camera can be very intimidating and awkward. Most people shy away from having their picture taken. And you definitely do not want those expressions coming out on your wedding day. The Engagement Session is basically PRACTICE. It is a time to get comfortable behind the camera. A time to get to know your photographer and how they shoot. By the time the session is over most couples feel relaxed and at ease with the photographer. This kind of relationship is important to have on the day of your wedding. It is not as awkward having a camera following you for a day if you feel like that person is a friend. 3). Lastly, Engagement Sessions are great for Save the Date cards. These are cards that you can send to your friends and family to announce your engagement and your wedding date. Make them fun and unique to you as a couple. 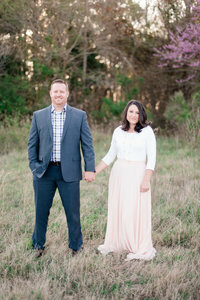 So these are some of the reasons why I think getting Engagement pictures are a must! And a good thing with hiring us and your wedding photographers, is that a complimentary Engagement Session is included in any package. We want you to feel comfortable with us and get to know us so that is why we do not charge an additional price. Let us know if you are engaged! We would love to hear more about the details of it all!